Matchday 28 saw Carlo Ancelotti’s Napoli rock up at the Artemio Franchi and give us a good game with Dries Mertens looking a threat everytime he got the ball. Both sides defensive performance was quality and just when it looked like finishing goalless Jordan Veretout drove a thunderbolt of a shot straight past the despairing Napoli keeper to give us a 1-0 win in the 91st minute. A fantastic three points gained in the dying minutes of the game. Empoli away next and we found it difficult to break them down apart from a single goal from Jordan Vertout who is looking sharp again after coming back from injury but that’s 2 in 2 now for him and thanks to him another 1-0 win as we get closer to European qualification. With Fedrico Chiesa being nursed back to full fitness Kevin Miralles is getting some game time and it was the Belgian who got us up and running and on our way to a another three points and a 2-0 win against Chievo. The game was dead at half time with our 2nd goal coming courtesy of an own goal just before the interval. Another clean sheet would come when we travelled to Frosinone for Matchday 31 were we came away with all the points after goals from Giovanni Simeone and Marko Pjaca giving us a 2-0 win that extends our unbeaten run to 7 games which includes 6 wins on the bounce and 6 clean sheets from 7 games. Just when we are feeling good about ourselves we manage to put in a very lack lustre performance at the Artemio Franchi against Atalanta who to be honest played us off the park dealing us a 0-2 defeat that brings us crashing back down to earth. It was a game that I can not explain why we performed so bad, we looked like we had never played together before failing to put two passes together. I suppose we have to give credit to Atalanta who themselves are making a late push for European qualification. Going in to Matchday 33 an away game at Genoa we looked to be suffering an hangover from the Atalanta game when we went 0-2 down in the first 30 minutes. We managed to sneak a goal back on the stroke of half time when loanee Marko Pjaca fired in from 12 yards. I got the lads in at half time and gave them a roasting which seemed to work when Christian Nørgaard levelled with a cooly placed finish in the 48th minute. All our good work to get back in to the game was undone late on when Morosini broke our hearts after unleashing a shot that gave Lafont no chance and condemn us to a 2-3 defeat. Realing from back to back defeats I decided to get the lads in for an extra training session this week ahead of our home game against Sampdoria, I also decided to shake the starting XI up by dropping Milenković, Mirallas and captain Benassi with Vitor Hugo, Cortinovis and Veretout all coming in. Something definitely worked has we raced in to a 3-0 lead in the first half with goals from Marko Pjaca and a brace from Giovanni Simeone to complete an eye catching first half display. Our visitors pulled a goal back late in the second period but it was all in vain with us getting back to winning ways with a good 3-1 win. Elsewhere Internazionale were crowned Champions of Italy after an impressive 5-1 win at home to Udinese who would be our opponents and hosts for Matchday 35. With Udinese still smarting from their heavy defeat and still in with a good chance of European qualification I knew this would be no walk in the park and I was proved right when we went a goal down on the 10 minute mark. We came back at our hosts well though and went close when Norgaard rattled the cross bar just 2 minutes later. Norgaard was having a good game and played a beautiful slide rule pass in to the feet of Mirallas who put us level in the 15th minute. By half time we were controlling the game with our midfield three of Benassi, Norgaard and Diakhate dominating the game. It was one of that trio Benassi who grabbed the winning goal half way through the second half and confirm European football coming back to Florence next season it was just a matter of which competition it would be with us now sat in 3rd place and a Champions League place in our reach. Matchday 36 was all about Giovanni Simeone who put in a five star performance scoring an hat-trick to win us the game 3-2 against relegation threatened Bologna managed by Fillipo Inzaghi. This win puts us in a great position to finish in 3rd place in the table that will be confirmed with a win in our next match. The penultimate game of the season would be an away trip to face SPAL knowing that three points would guarantee a third place finish. We got off to the worse possible start when Petagna put our hosts 1-0 up in just the 2nd minute of the game after he caught our defensive unit sleeping. It was the wake up call we needed and soon we were back on level terms after Marko Pjaca rounded off a nice move in the 10th minute. Although we created chances in the first half we went in all square at the break so I decided to give the boys a rocket of which made them all motivated for the next 45 minutes. We continued to create chances and when Federico Chiesa picked the ball up out on the right and played a one- two with Simeone there would be only one outcome when the Italian wonderkid unleashed an unstoppable shot in to the roof of the goal to put us 2-1 up and it was the goal that won us the game 2-1 and guarantee a third place finish. The final game of the season saw us travel to our rivals Juventus who had finished 2nd in the league behind Internazionale and one place ahead of us in third so the game was all about our rivalry and for the first hour there was nothing to separate both sides until Ronaldo set up Dybala to open the scoring. The same combination made it 2-0 but this time it was Ronaldo who got the goal that gave the Old Lady the 2-0 win and bragging rights for the next few months. Very pleased to pick this award up in my first season in charge but it’s the players who deserve the credit. The squad shown some real grit and courage amongst playing an attractive style of football. Giovanni Simeone netted 20 goals including 19 in Serie A whilst Marco Pjaca on loan from Juventus pitched in with a very valuable 11 goals. Well thats Season one over with and no time for goodbye , we have a pre season coming up that will be interesting has I go about replacing Simeone. It’s not just Simeone’s goals that I need to replace Marko Pjaca returns to Juventus after his loan spell and he scored a lot of important goals for us this last season so it’s important that we can get this sought of return to support our new number 9. This first season at the club saw us start to build the foundations that will see us prosper for seasons to come. We saw the emergence of Abdou Diakhate who I brought in to the first team picture from day one. The Senegalese midfielder covered more miles than any other player in Italy this last season and proved he could mix it with the best. I will be looking for him to push on this next season and become a valuable first team player. 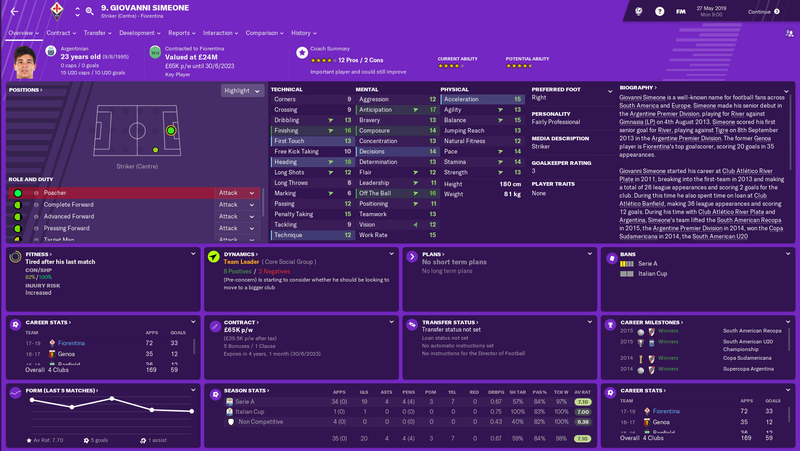 I have been enjoying reading the quality blogs that have been released since FM 19 was released and there is too many to mention but I want to give a shoutout to the following who have also taken up the reigns at Fiorentina starting with Chris Fuller and his Shades of Purple save which I look forward to reading with each Part that he releases. Next up is a chap over on twitter Andrew Ord who is also managing the Viola and started to write about it on his blog here. That’s an excellent first season you’ve had. To claim a Champions League place AND Manager of the Year at the first attempt is quite something. It’s interesting to see that Biraghi was the Fans’ Player of the Season, just like in my career. 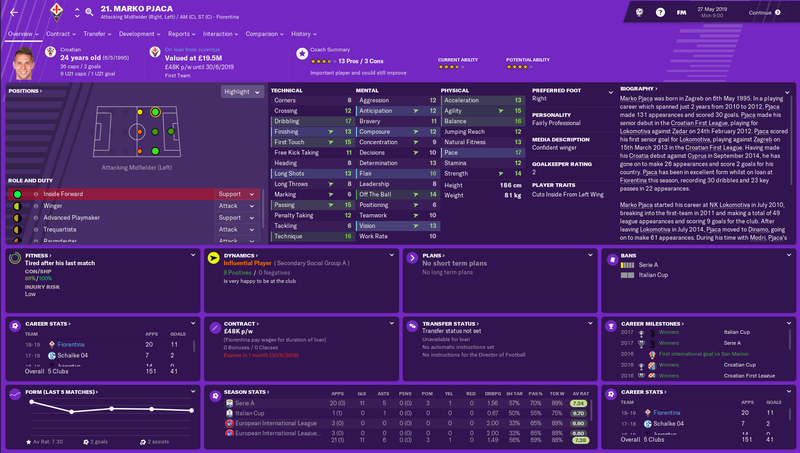 When you look at some of the players at Fiorentina’s disposal, Biraghi’s importance to the side seems to be underrated (though not in FM, obviously). Simeone’s goals will be missed, but you’ve struck a very good deal with PSG, and I believe you’ll find just the right man to replace him. Cheers once again for the mention (even if you didn’t quite get the title right), and thanks for alerting me to uptheborofm. I’ll be sure to check him out too. 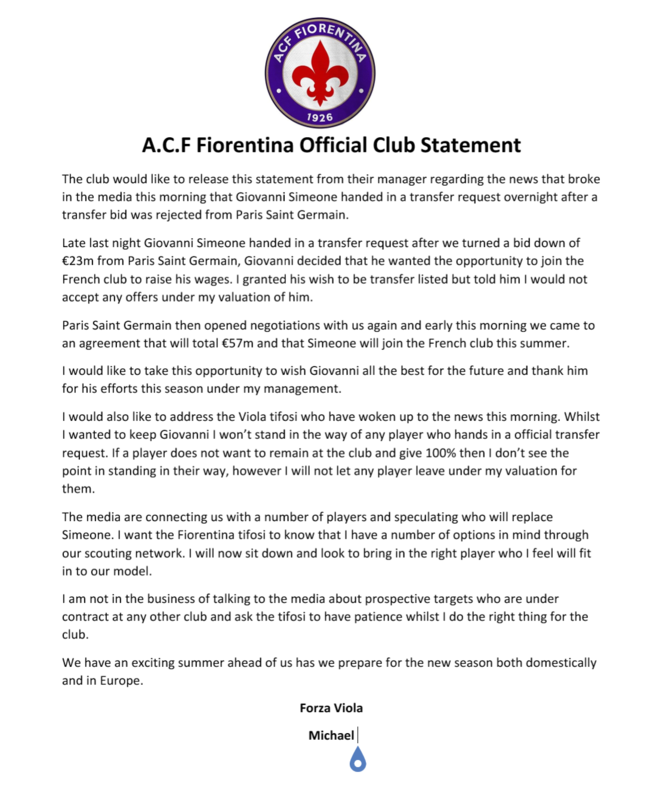 Good job in your first season with la Viola finishing 3rd. Will be interested in seeing how you prepare for the Champions League in your next update, and who your replace your number 9 with and if you will alter your system. I’d be interested in reading more on how you adapted your tactic throughout the season or if you left in largely unchanged from pre-season. Do you use opposition instructions during the season? Thanks for the comment… I kept the tactic pretty much the same throughout the season. I changed mentality in a couple of games and dropped the box to box midfielder to a Segundo Volante. I did not use opposition instructions.